Ireland face some familiar foes in Group D.
IRELAND AND DENMARK will meet again after they were paired together in Group D for the Euro 2020 Qualifiers. Nations League finalists Switzerland, Georgia and Gibraltar complete the five-team group, a fate which has been reasonably kind to new Ireland boss Mick McCarthy considering the alternative. 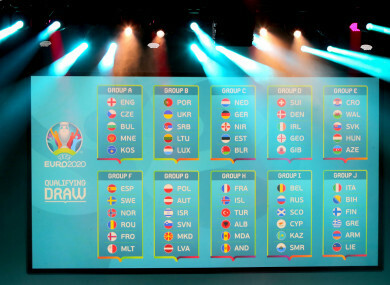 The Boys in Green were initially drawn into a Group of Death alongside the Netherlands and Germany at this morning’s draw at the Convention Centre in Dublin. But, due to Uefa regulations which state that a maximum of two Euro 2020 host countries can be in the same qualifying group, Ireland were moved sideways to the comparatively easier Group D.
Instead, it was the next team drawn — Michael O’Neill’s Northern Ireland — who must face the tricky challenge of the Dutch and Germans. The computers again intervened on Ireland’s behalf when Azerbaijan — another host nation — were initially drawn into Group D, only to be replaced by Gibraltar. The fixture list for the qualification campaign will be confirmed by Uefa later this afternoon. But, because Ireland have been drawn into a five-team group rather than a six-team group, there will be a window for friendlies during the qualification campaign. Email “Ireland drawn to face Switzerland and Denmark in Euro 2020 qualifiers”. Feedback on “Ireland drawn to face Switzerland and Denmark in Euro 2020 qualifiers”.